A FORMER Yorkshire fell-running champion has been jailed for 18 years for the attempted murder of a UK Athletics official after a row about test samples. Lauren Jeska, a transgender athlete, left Ralph Knibbs with life-threatening stab injuries after taking two knives to his office at Birmingham’s Alexander Stadium in March last year. Sentencing Jeska, 42, who formerly ran for Todmorden Harriers, Judge Simon Drew QC said her crime had been a “cool, calculated attack” which had been “wholly unprovoked”. Two of Mr Knibbs’ colleagues were also injured after tackling Jeska as she launched what prosecutors called a “frenzied” assault. Jeska had previously admitted attempting to murder former Bristol RFC centre Mr Knibbs, who was UK Athletics’ head of human resources. 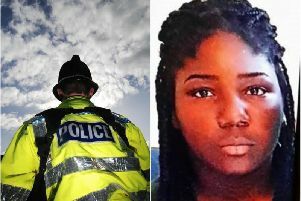 On March 22 last year, she drove from her home in of Machynlleth, Wales to Birmingham, calmly signing herself in at the office, before arming herself with two large kitchen knives she had concealed in a rucksack. She then strode into the open-plan UK Athletics office, following the receptionist and seeking out Mr Knibbs before launching a bloody assault in which she repeatedly rained blows down on his head and neck. One eyewitness said Jeska looked “as though she were trying to skewer meat”. Opening the case, Richard Atkins QC, said: “The defendant is a transgender athlete in dispute with UK Athletics about eligibility to compete as a female athlete. As a result, her racing results had been declared null and void, the court heard. The week before the attack, Mr Knibbs had gone to meet Jeska at her home to discuss the “long-term” issue with the sporting governing body. Mr Atkins added that following the incident, Jeska told a psychiatrist “she fantasised about going to the Alexander Stadium and killing all of the staff”. Describing the attack, the prosecution barrister said: “(Office) CCTV captured what can only be described as a frenzied attack. Mr Knibbs was caught “completely off-guard”, with the 52-year-old recalling the sight of his own blood. Despite being stabbed in the throat, in a blow which nicked both his carotid artery and jugular vein, Mr Knibbs managed to grab both Jeska’s wrists while shocked colleagues rushed to his aid. In the melee, two other men - Tim Begley and Kevan Taylor - were injured as Jeska resisted, before half a dozen workers managed to pin her to the ground until police arrived. Others, including a former Royal Navy paramedic, helped stabilise Mr Knibbs who had begun to fear he might bleed to death. The judge paid tribute in court to the “courage” of Mr Knibbs’ colleagues. Mr Knibbs himself told the court the “traumatic, life-changing experience” had robbed him of his independence, with long-term nerve damage suffered both in the attack and by necessary life-saving surgery afterwards. He had also suffered a stroke during the assault, resulting in partial permanent sight-loss. The judge told Jeska, of Wesley Terrace, her attack had been “planned and executed with chilling precision”, calling the case a “deeply disturbing and complex one”. Jeska, who gave no reaction to the sentence, was handed concurrent jail terms after also previously admitting two counts of assaulting Mr Knibbs’ colleagues and carrying knives in public. She was given an extended licence of five years, to be served after her release. After the hearing, Jeska’s parents, Pauline and Graham Jameson, said in a statement: “We deeply regret the injury inflicted on Ralph Knibbs”, adding that the attack was “out of character” for their daughter. The couple claimed Jeska had had “conflicting rulings” on her eligibility to compete from UK Athletics. “UK Athletics retrospectively removed her from result lists. She appealed against this. She also took legal advice about challenging the UKA, and was advised to wait for their reply,” they also claimed. “After a long delay, she was verbally promised reinstatement, but this was not done. Speaking after the hearing, Detective Sergeant Sally Olsen, of West Midlands Police, said: “We understand Jeska had been asked to provide further evidence of hormone levels after historical complaints to UK Athletics that she had an unfair advantage competing in women’s events because she had been born a man. She added: “Jeska carried out a violent and unprovoked attack on a man whose sole objective was to enable her to compete.